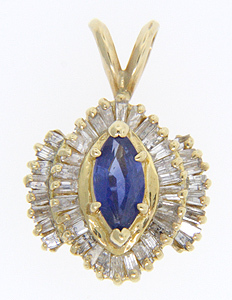 A marquis cut sapphire is surrounded by 1.50 carats total weight of baguette diamonds on this 14K yellow gold vintage pendant. The pendant measures 7/8” in height and 5/8” in width. Circa: 1950.